12/20/2013–Charlotte, NC– In July of 2013, the 111th Search and Rescue Cadet Squadron partnered with Wreaths Across America, in an attempt to sell enough wreaths for every veteran in Crown Memorial Park to have a wreath. For six months, cadets and senior members sold wreaths to friends and family members, and solicited corporate donors. They also spent a Saturday successfully selling wreaths in front of Walmart. With a little over 100 veterans buried at Crown Memorial Park, it was close, and the squadron thought they were going to come up short; but in the end the squadron was able to place a wreath on the grave of all the veterans! On a chilly, wet morning, December 14, 2013, members of the NC-111 met at the cemetery, located in Pineville, North Carolina. Thankfully, the rain held off for the first few hours while each veteran received a wreath and a slow salute in honor and memory of the sacrifices they and their families made for our country. At the start of the pre-ceremony, the rain could hold off no more, and the sky began to sprinkle. C/Maj Jonathan Knapp read about the five branches of the military as cadets raised flags for each. At precisely twelve noon, the official ceremony began, led by Maj John Barbee. 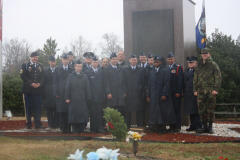 Representatives from the military, members of Civil Air Patrol, and members of the community who had lost loved ones, assisted each other in laying a ceremonial wreath for the United States Army, Marines, Navy, Air Force, Coast Guard, Merchant Marines, and Prisoner of War/Missing in Action. It was truly a time to remember, honor, and teach of the sacrifices veterans have made and continue to make for us all.